So the real football season got going this past weekend and with it my Chicago Bears' Super Bowl campaign. The next twenty weeks or so will bring plenty of ups and probably a few downs. Hopefully it will end in complete elation but most likely there will be that inevitable disappointment that smacks me right in the face around mid-December. In the meantime, however, let's just enjoy a bit of gridiron with some tasty tailgating fodder, washed down with a crappy ice cold American beer or two. Or 6. To kick thing things off (HA. get it?) I made my blue cheese dip. You can't have buffalo wings without blue cheese dip, it just wouldn't be right. This recipe is the absolute bomb and it's totally simple. Mix 1/2 cup of mayonnaise, 1/2 cup of sour cream, 1/2 cup of crumbled blue cheese, 1 diced clove of garlic and a tablespoon of white vinegar. A dash of salt and pepper and you're good to go. Cheaper than store-bought and a whole lot better. Just don't pour it all over your lettuce and tomatoes and try to call it a 'healthy salad' (*COUGH, AMERICA, *COUGH). I absolutely love a good chicken wing. 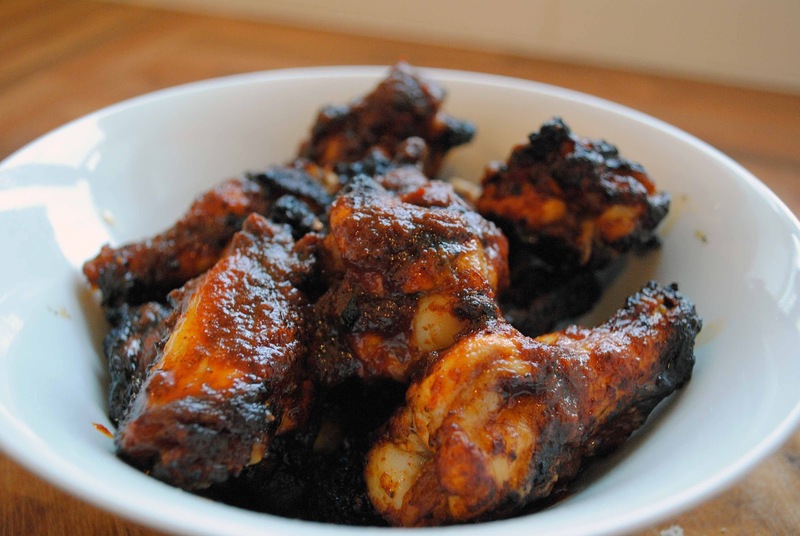 I think in this world people can be split into two categories; those who know how to strip down a chicken wing of all its meaty goodness, and those who have one bite and then reach for the next one. I proudly (and disgustingly so) fall into the first category and try my darndest to associate myself with similar people. Unfortunately my girlfriend is a one-and-done type...it's disappointing. 1/2 teaspoon of salt, 1/2 teaspoon of cayenne, 1/4 teaspoon of black pepper and tablespoon of paprika. If you're feeling a little bit less adventurous pull back on the paprika a little bit. Just a little. Get yourself about 6-7 chicken wings, cut off the wing tips and then cut through the joint. If you're unsure how to do this, there's a pretty good guide here. Melt about 50g of butter in a pan, then take it off the heat and mix with a tablespoon of honey, and 2-3 tablespoons of any hot sauce. I used the delightfully-named 'PAIN' as seen above. I think my parents picked it up at a novelty store, but it's actually really decent. Blows your country socks off though. It's all about trial and error here...thankfully the blue cheese dip does a good job at soothing burning lips. 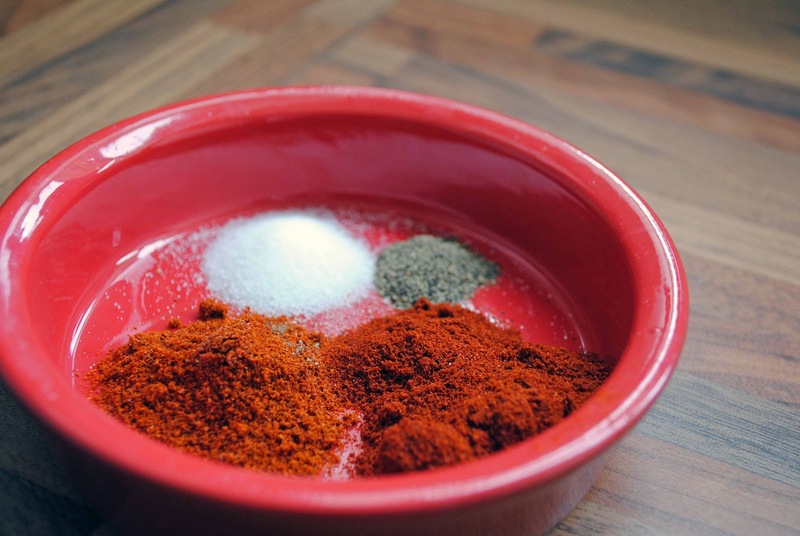 Mix your marinade with the dry spices then pour over the chicken (leaving a few spoons aside to pour over after they've cooked), and leave in the fridge for a couple of hours. Burger time. I'm a bit of a fan of a burger (he says patting his belly) but this was a total experiment for me, and it absolutely worked a treat. I diced up 2 rashers of bacon then mixed it up with 500g of beef mince, added 2 chopped spring onions, a dash of soy sauce, one egg and a bit of seasoning. The egg makes everything a little...gloopy, so the cooking ring was a must to avoid a massive meaty mess. Spoon about a...spoon's worth into the bottom of the ring, flatten it down and then add a couple of chunks of blue cheese, and spoon another spoon (or so..this isn't exact you see) on top. Flatten, remove the ring and you have a beautiful-looking patty. Marvellous. 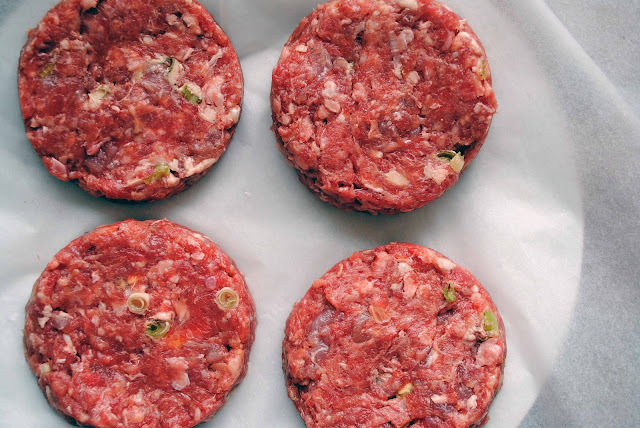 Stick your burgers in the fridge for 30 minutes or so to firm up. Sweet potato fries, done right, are an absolute show-stopper. Plus, they're marginally healthier than normal fries, which will make absolutely zero difference when you lather them with blue cheese dip and shove another chicken wing in your face. OH WELL. Nothing special here. A bit of rock salt, rosemary and olive oil, line them on a tray, not touching if possible. Stick them in the oven at 200-ish for about 30-40 minutes, turning halfway. Chicken goes under the grill, 3-4 inches away from the heat, for about 10 minutes either side. Or until your kitchen starts smoking and you need to open a window. Don't worry if it starts to blacken a little bit, that's just those spices and the honey caramelising. Flavour City, USA. Pan-fry the burgers for about 3-4 minutes on each side and then stick in the oven for the same again to make sure they're cooked through. The blue cheese just oozes out when you bite into them...it just works, oh it works so well.